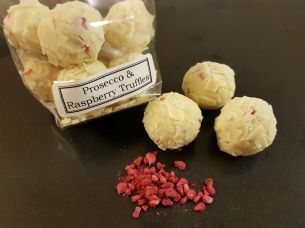 A bag of 8 hand made Prosecco and raspberry truffles. Made with real prosecco, raspberries, fresh cream, high quality chocolate, and just a hint of unsalted butter. White chocolate: cocoa solids 28% minimum, milk solids 27% minimum.